Anyone can have a quick visit to this history-filled town and have selfie photos near the two oldest sundials in the Philippines. In Tagudin, visitors can also enjoy its church and belfry, the view deck overlooking the wide Amburayan river and bridge, the more than 100 year old-old light house, Farola beach and the 200-meter Ambalayat hanging bridge. 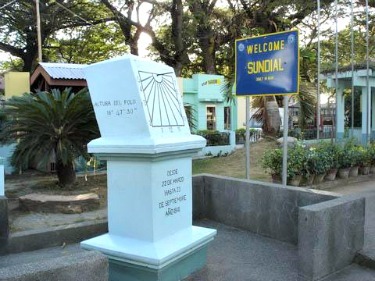 The two sundials, which date back to the Spanish period, are found in front of the municipal hall and inside the Saint Augustine School beside the Tagudin Church. Near the sundials are the Tagudin Church and belfry. The church is of Baroque architecture completed by Fr. Juan Sorolla in 1832. Like many Ilocos belltowers, the Tagudin belfry was erected away from the church to prevent it from slamming the church during earthquakes. Next stop from here is the Farola lighthouse in Barangay Farola which can be reached by tricycle. This lighthouse was built by a group of missionaries from Belgium who landed on June 21, 1910 to symbolize their landing in the country. These are the missionaries who founded St Louis University in Baguio City, St Louis College of San Fernando City and St Augustine School of Tagudin. The small Parol or lighthouse, which draws power from solar panels, had since guided fishing vessels. The Farola beach offers a quiet get-away. It has dark sand and pebbles. The 200-meter Ambalayat hanging bridge is for thrill seekers. This foot bridge is also used by cyclists. From Manila, visitors can first go to the view deck right after the bridge connecting Ilocos Sur and La Union. The view deck is in Barangay Bio where one can enjoy the Amburayan river that comes from Benguet. Fishing and picnicking can be done by the river bank.